Oops, I guess that’s a slight misquote of the famous mountain climber, George Mallory. But how else to introduce Rick Cavallaro, who invented an unproblem and then solved it—to the consternation of many an internet flamer—and opened up new possibilities in wind energy extraction, all while proving that, yes, it absolutely is possible to build a machine that will go dead downwind faster than the wind, using only the wind. This was the team setting up . . .
And this is the thing in action . . .
A certain Nobel laureate was less graphic but no less scathing. But that was then, and this is now, and the machine created by the “loonies” of the Thin Air Designs team has busted 50 mph and gone three times faster than the wind, dead downwind. Using only the wind. More than once. I’m telling you. Given the tight strictures imposed for an official record, the run submitted for ratification was “only” 2.8 X. This is now official, certified by NALSA, the North American Land Sailing Association, at 27.7 mph in a wind of 10 mph. In nearly 20 runs over two days, in the high heat of the high desert, while thin snow still veined distant mountaintops, every run exceeded 2 X, and if things work out over the next few weeks, these guys are going for an official 3 X. Through a series of unlikely events I found myself named as one of two NALSA observers for all of Cavallaro’s officially-timed runs, and I’m believing the same principle would also work on that more complicated interface we call water, should anyone be motivated, though that seems even more unlikely than the story I’m relating here. I mean, if Don Quixote tilted at windmills . . .
How could I resist a project labeled DDWFTTW? 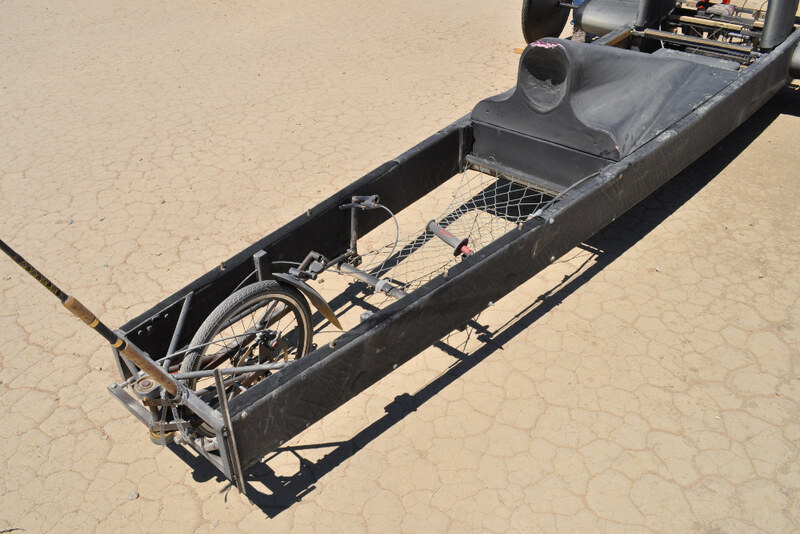 At El Mirage Dry Lake in the Mojave Desert, over the July 4 weekend, I watched this pretty agricultural, mixed-technology contraption top 50 mph more than once in winds that never got out of the teens. It doesn’t begin to tap the potential of the concept. Actually, it does begin. Certain elements were machined to a fare-thee-well; others were merely good enough to test the concept on the cheap. 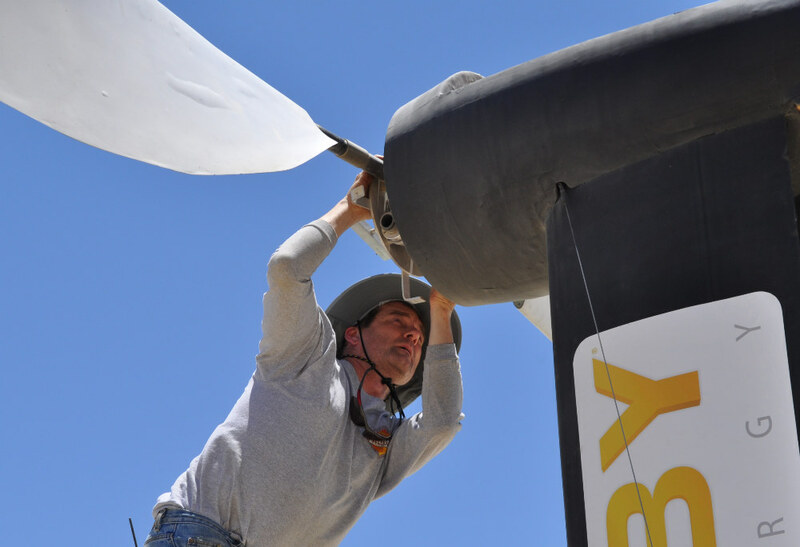 When early trials last spring exceeded expectations, aerodynamic fairings were carved out of foam. Velcro holds them in place. The driver sits in a web of netting, inches above the desert floor. Yes, that’s a bicycle tire . . . But the machined parts are no joke. At speed, the craft is developing 500-700 ft lbs of torque on the prop shaft—close to the torque output of a supercharged Corvette V8 . . . The left axle is longer (a wider stance) to account for prop torque . .
And the propeller diameter is 17.5 feet. Notice an inkie-winkie delamination on the blade of the prop . . . Yes, prop. There isn’t a sail or even a wing on what was known as the BUFC, the Big Ugly #&*! 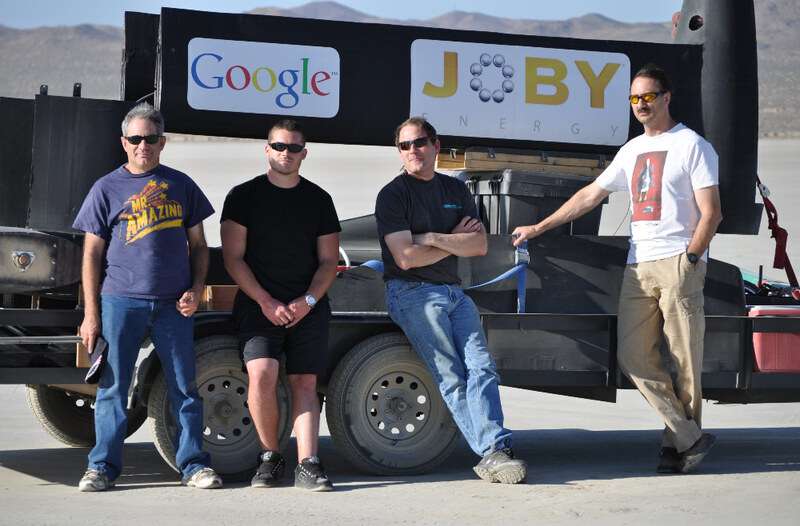 Cart, until Joby Energy and Google put some sponsorship behind it. 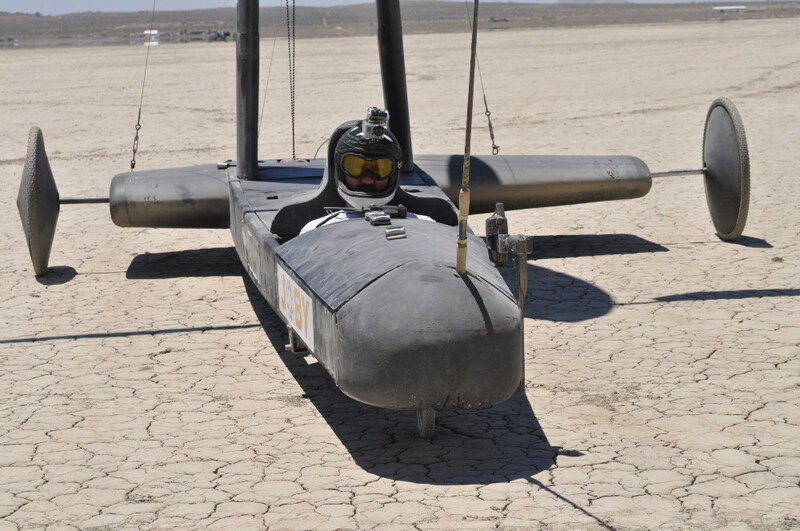 Now, with a nod to landsailing speed record holder Greenbird, Thin Air Design’s BUFC thingamajig is known as Blackbird. No sail, no wing, but, aerodynamically speaking, there is no fundamental difference between the angles of a spinning propeller blade and the angles of a sail that is being tacked downwind, hot. Sailors know that an ice-boat, for example, can tack downwind, building apparent, and beat a piece of paper blowing in the wind. What Cavallaro can do is beat a piece of paper, big time, right down the paper’s track. What did the wind know, and when did it know it? Believe me, I’d have found it hard to wrap my mind around this if my introduction to Rick Cavallaro had come from anybody other than Stan Honey. But here came Stan, with Rick in tow, and also JB Borton (chief engineer, machinist, and project bodhisattva). Stan, most readers will know, is arguably the world’s greatest ocean navigator, and he was a founder of Sportvision, the revolutionary software company that, among so many things in broadcast sports, “paints” football’s yellow first-down line, shows the path of a pitch in baseball, and tracks telemetry for NASCAR . Stan is also now on the case of developing better America’s Cup broadcasting for BMW Oracle Racing. Rick Cavallaro is the chief scientist at Sportvision. JB Borton is a world champion in soaring aircraft and the director of manufacturing for Sportvision. Rick is a kitesailor, and if you check the t-shirt you can guess what these guys do in their other lives. That’s JB on the left . . .
Stan introduced me to this pair at a talk given by the fastest sailor in the world, Richard Jenkins. 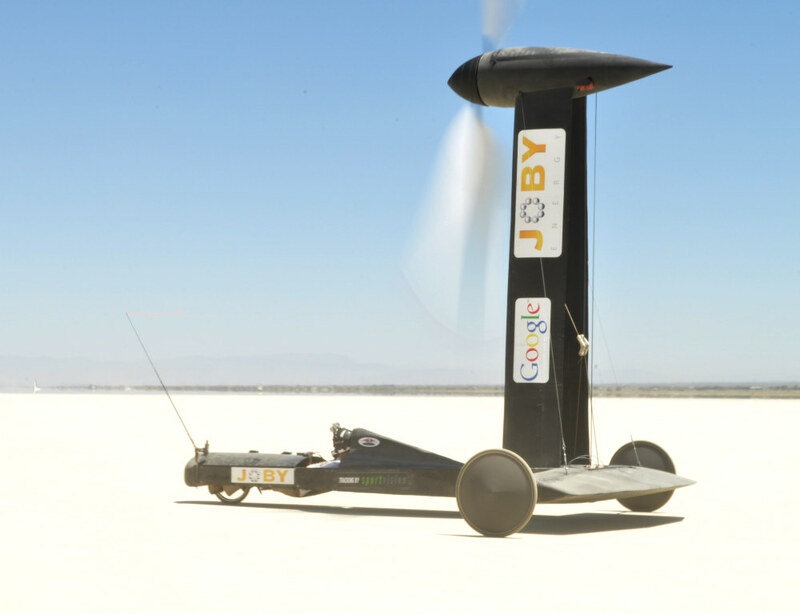 In 2009, in a very-different landsailer of his own, Jenkins fulfilled a ten-year quest by hitting a record 126.2 mph at Ivanpah Dry Lake in the Mojave Desert. Of course Stan, Rick and JB wanted to lend an ear. Jenkins’ talk to a lunch group on the San Francisco cityfront was very nearly his only public outing since becoming a world record holder. The DDWFTTW project was different, but. Three times windspeed is quite an interesting multiple, the more so when you consider that the goal was a “mere” double, and most people thought that was impossible. I mean, how can you use the wind to outrace it? On a different level of thinking, however, Jenkins’ wing-powered Greenbird was constantly fighting sideslip with fat tires and a wide track en route to an absolute speed record. Going DDW with the goal of “simply” outrunning the wind eliminates that problem while, admittedly, opening others. Borton, left, and Dill check the breeze. Or we could caption thisElvis, if you’re out there . . .
YOU’RE ASKING, HOW DOES IT WORK? I wish I could explain, but it’s best to turn the job over to Cavallaro, who notes that ice-boats and land-yachts routinely tack downwind at a net gain. That is, you could release a balloon and race it downwind, and win. “With a bit of thought it occurred that one could reproduce the aerodynamics and physical constraints of the land-yacht by simply having the sail follow a continuous downwind tack, but wind that tack into a spiral. Two such sails would simply form a propeller. 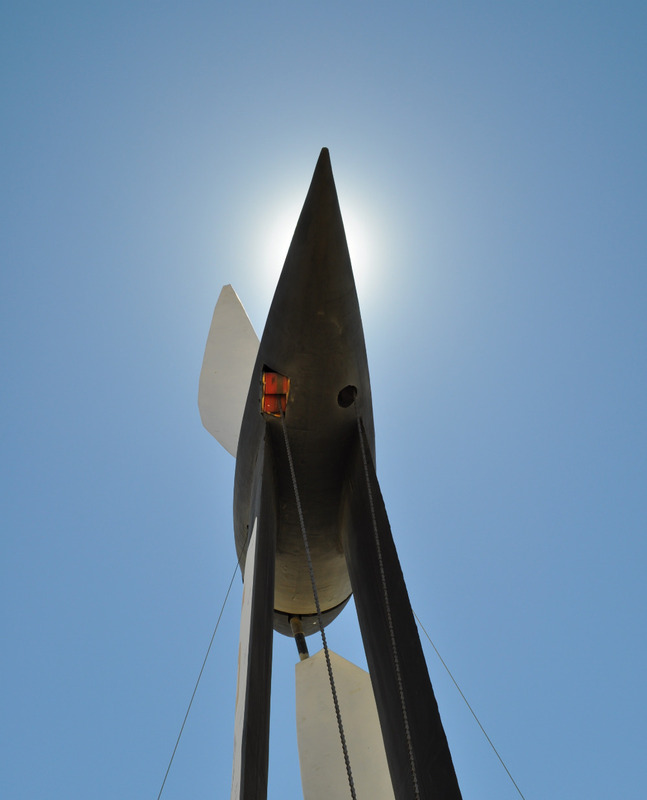 By gearing this propeller to a set of wheels, you could constrain it to follow the same downwind path that the sail of the land-yacht follows, but on a steady downwind tack. So it seemed such a vehicle could in theory be constructed quite simply. Several of them have had to adjust. Myself, I tell it this way. 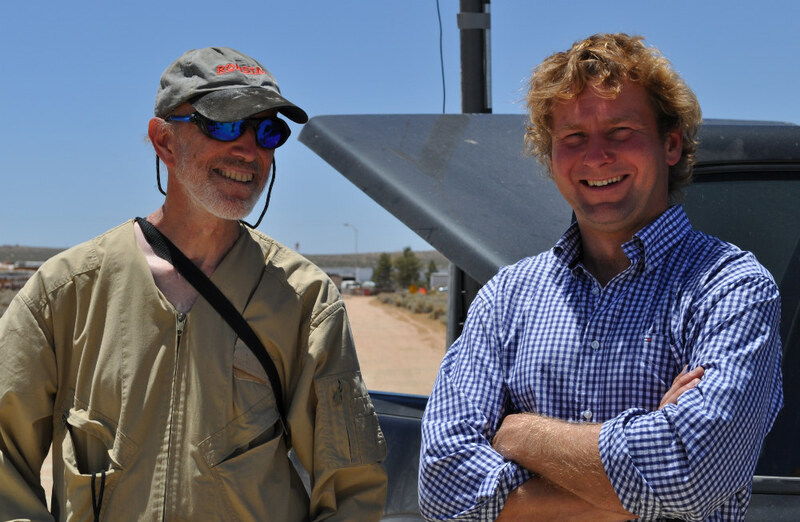 My job as Observer #2 was to stand behind the vehicle, sight the wind, share information via radio and arrive at a moment when Chief Observer Bob Dill—a past president of NALSA and until a year ago the fastest sailor in the world—would decide that we had a proper downwind setup. Dill was stationed at the bottom of the course. 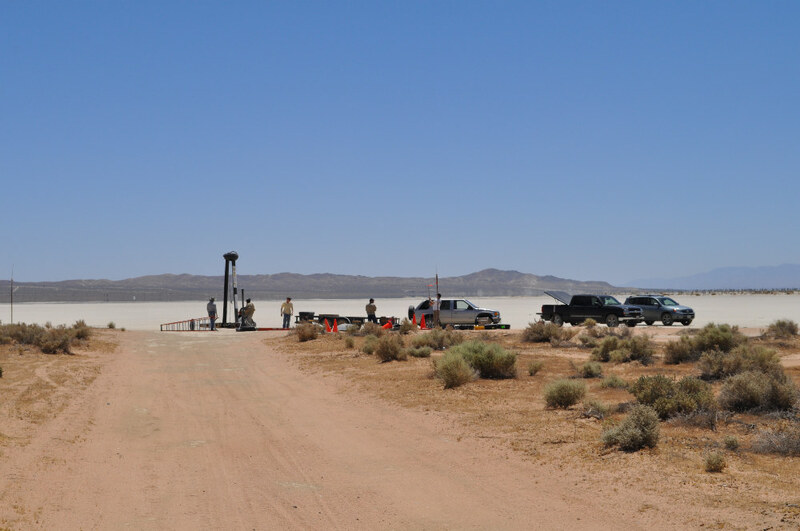 Wind speed, wind direction, vehicle speed and vehicle direction were each closely calibrated—and recorded—at multiple locations, mobile and stationary. 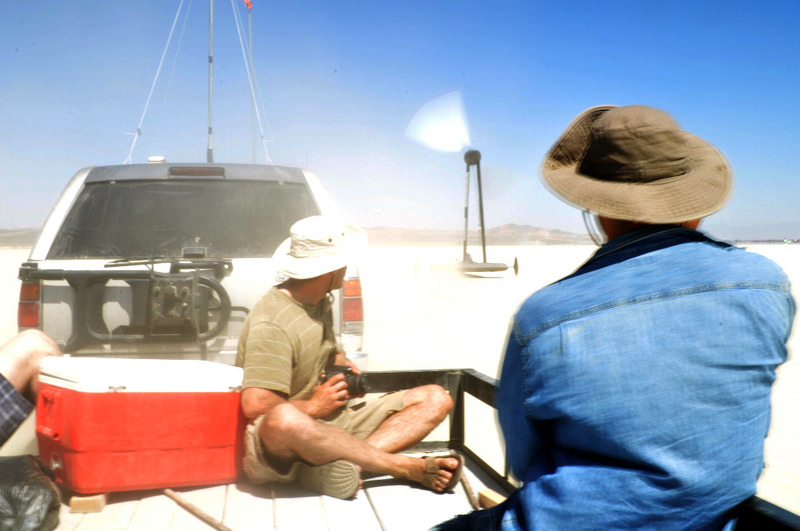 The breeze at El Mirage was up and down, and oscillating. The goal was to select a stable patch of breeze and run in that. When Dill and I agreed that we had what we wanted, we would give the team a go. Often, I jumped aboard a chase vehicle to observe the entire run. For once, I didn’t have to worry about salt water on my camera, but I’m still clearing the dust . . . 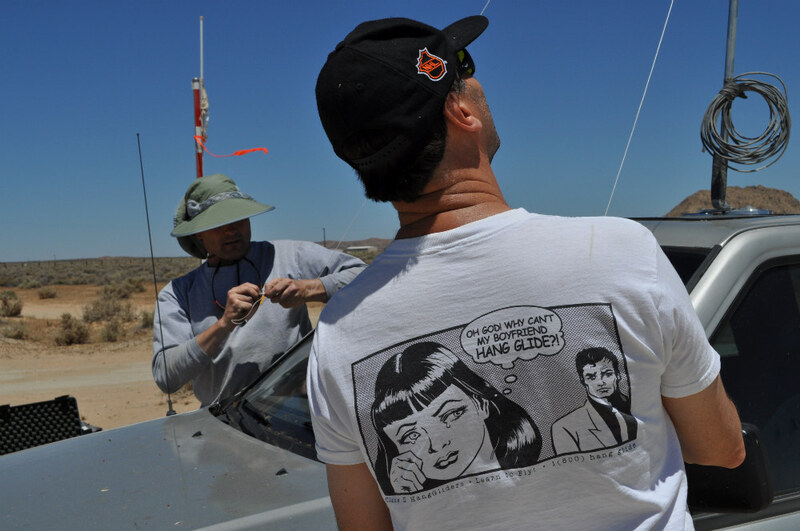 Some runs began from a dead stop, accelerating as the breeze moved the vehicle, but NALSA rules have always permitted a hand push, and JB usually put his back to it. Frankly, I don’t believe that pushing affected the final numbers on any of the runs. The cart will get itself to wind speed, push or no, and then it goes to work. But we did not correct for push/no-push. It is important to understand that the propeller and the rear wheels are directly linked via chain drive. Which also was the weak link. The best multiples were available in true wind speeds of 10-12 mph. Running in winds in the mid-teens got the machinery to the edge of its built-capability. 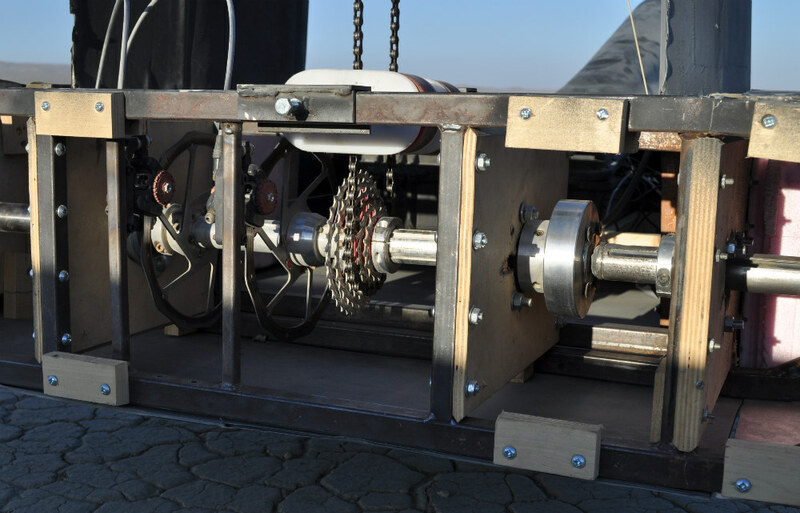 The BUFC was still accelerating on its fastest run when the chain broke at 51 mph. Rick studies the results of a run . . . So we would launch, and the yarns on the Blackbird would be blowing forward, downwind. But, now that this has been done, we can imagine the possibility of enhanced energy extraction, can we not? So there we were, unshaved but showered-down and burgering-down under the neon at some diner-dive in or near beautiful Palmdale, California and feeling pretty good. It wasn’t my project. I was there as a journalist double-billed with the title of Official Observer #2, and it wasn’t my job to create a success, but I would have been disappointed if the thing had been a fiasco, you bet. I had other options for my July 4 weekend, 2010. The same could be said for Bob Dill, who deserves to be recognized beyond his nexus of landsailing and iceboating. Beyond the fact that he once held the sailing speed record (on land) at 116 mph, this is one constructive, imaginative, generous s.o.b. 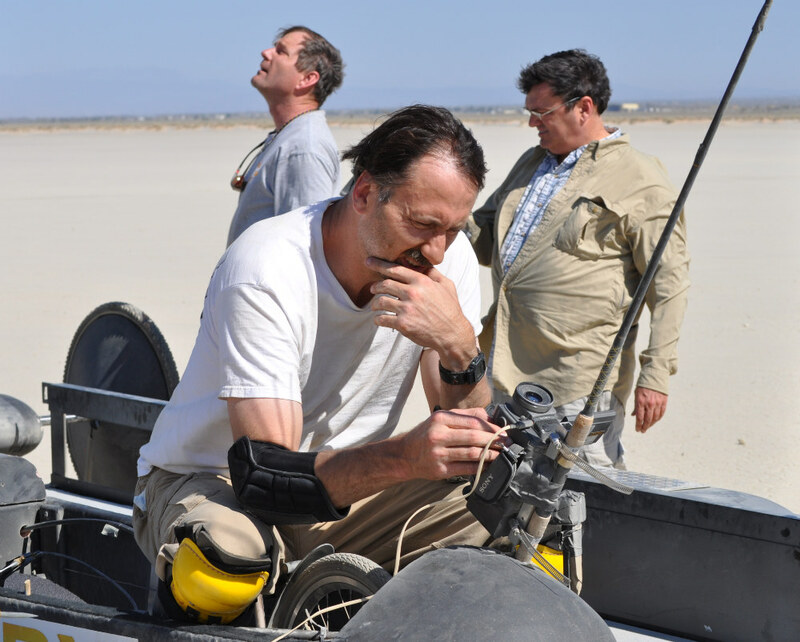 Last spring he invited the Thin Air Designs team to NALSA’s “America’s Cup” event at Ivanpah Dry Lake, and what he saw convinced him to become a supporter, rather in the way that, while Richard Jenkins was working his booty off to take away Bob Dill’s speed record, Dill aided and abetted at every turn. This is not a story about Bob Dill, but while we’re not on the subject, in all honesty, I think you ought to know. We enjoyed, shall we say, a frank and wide-ranging conversation, stimulated by garlic fries that you might not easily find beyond the culinary inspirations of Palmdale. The Thin Air Designs team . . .
Jenkins stayed for most of the day and observed most of the runs. Until he wrote a “guest editorial” on the project blog, Rick says, “I had no idea he was such a raging skeptic.” But Richard Jenkins is a reformed skeptic. Here is what he shot with his video camera. I like it because it was not shot by a member of the team, and the vehicle self-starts. Looking closely in full-screen mode, I have no problem seeing the telltales change as the craft accelerates through windspeed. Here is what the Richard Jenkins wrote about the experience. 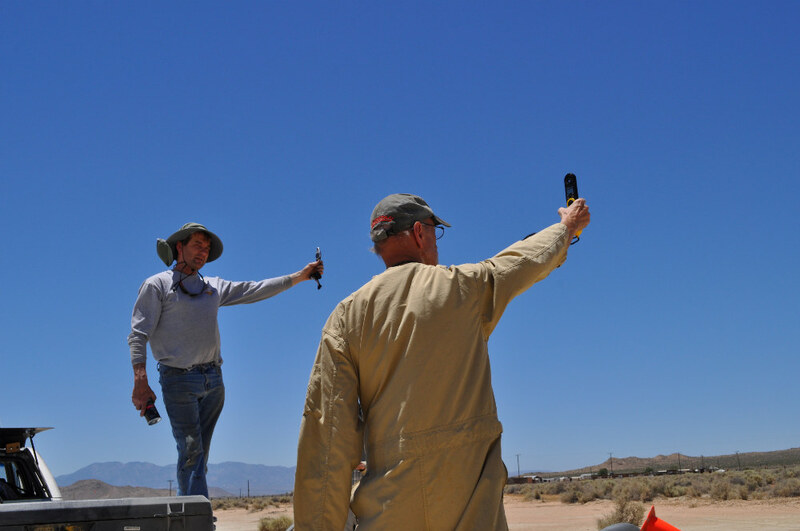 “One night, I was happily drinking my beer and tending to my inbox of endless, boring emails when Lester, my landsailing buddy, texted me a link to fasterthanthewind.org. Lester knows a lot, and if he says this needs my attention, then it gets it. I am not sure if it was how many beers I had had, or simply the inane nature of the quest, but I laughed enough to email all my friends to share the absurdity of their mission. My heart is split between belittling idiots, and saluting eccentrics, and this downwind quest lay somewhere in the middle. These loonies were pursuing a pointless goal, doomed to failure, but there was genuine merit in the myth and their enthusiasm. I dismissed it as utterly impossible. Traveling through zero apparent wind, with no stored power? Impossible. Why would you even attempt it? (Though I’m no stranger to that question myself!) But had I been asked to bet at that moment, I would have just lost a lot of money. A few months later I actually met the idiots in question and, to my surprise and concern, we not only have a few mutual friends, but they seemed to be technically credible. But, everyone makes mistakes, and I let them off as decent people with a blinkered view of fundamentally flawed engineering…. A few months later they were claiming success, and if it was not for another great friend, Bob Dill, advising that they were actually correct, I would have discarded their claim as an April fool. I thought about the possibility that I was wrong, and then considered that as Bob was getting on and had a bit of a shake with his stopwatch finger; maybe it was he who was mistaken. 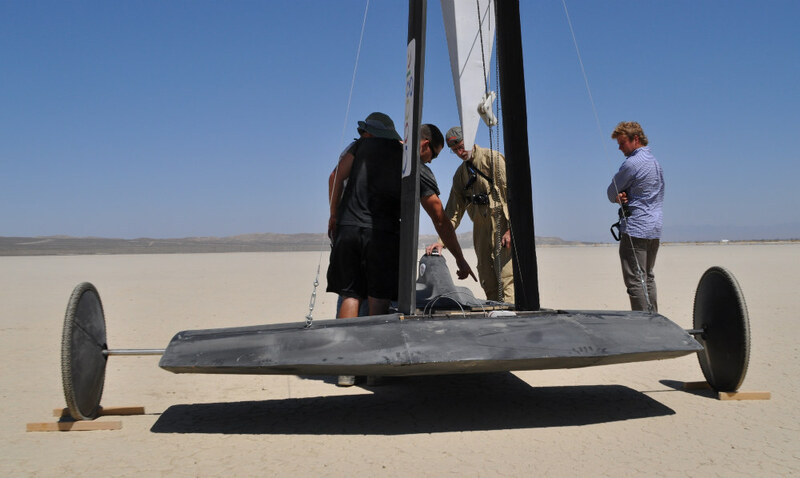 There was, however, a growing momentum of technical people (who should have known better), saying that these idiots have actually proven that it is possible to travel faster than the wind going directly down wind. The video speaks for itself. These guys are not idiots, but sincere, genuine, technical people who took a myth and made it real. It works. It starts from rest, trundles to true wind speed, then powers to a multiple of about 3 times the true wind speed. 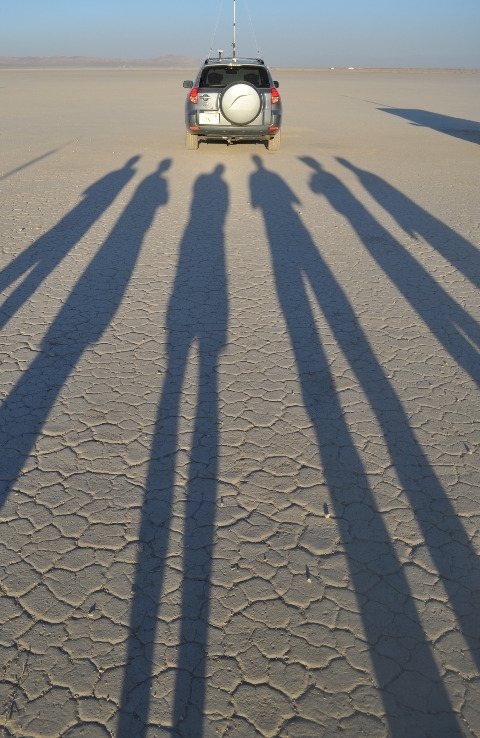 As the sun sinks in the west, we are riding the shoulders of giants . . .